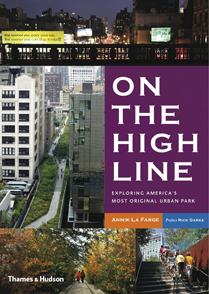 On the High Line: Exploring America’s Most Original Urban Park, by Annik LaFarge; New York: Thames & Hudson, 2012; 218 pages, $29.95. Everybody loves New York’s High Line, because what’s not to love? The 1.45-mile park, stretching through the Meatpacking District and West Chelsea along New York’s West Side, offers a pleasant amble with the different perspective of a city viewed from 30 feet up in the air. There are the beautiful steel tracks, places to sunbathe, a big window and benches for convenient traffic and people watching, and a variety of gardens with slightly different moods and uses (the Gansevoort Woodland, the Washington Grasslands, the Chelsea Thicket, the Bog, the Lawn, the Astor Farmland). Since its opening in 2009, the High Line has attracted some four million visitors a year, nearby real estate values have soared by an estimated $2 billion, and over 20 years the project is expected to produce some $900 million for the city in extra tax revenue. All this at a construction cost of about $152 million (for sections one and two). From 1934 to 1980, the elevated railroad structure on which the park is constructed was part of a freight transportation system that kept New York City in foodstuffs, both perishable and nonperishable. Annik LaFarge, the New York writer and editor who lives above the High Line in Chelsea and who wrote On the High Line, explains how trains traveling south entered the second floor of a new terminal (St. John’s Freight Terminal on Spring Street), which connected to the hub of maritime commerce on the Hudson River piers and to the rest of America. “Inside, 14 freight elevators were available to transport goods to the ground floor, where as many as 150 trucks could simultaneously load or unload cargo.” As the 20th century progressed, the growth of interstate trucking, global air travel, and containerized shipping did away with the need for such a transportation system, leaving, however, the elevated track—gone, literally, to seed—and a lot of related buildings, including the Manhattan Refrigerating Company, the Otis Elevator Company, and the Starrett-Lehigh Building. In August 1999, Joshua David and Robert Hammond, a writer and an entrepreneur, respectively, met for the first time at a community planning board meeting about the future of the railroad and went on to found Friends of the High Line, a charity that raised millions of dollars and led the fight to save the structure and create the park. In a defining moment in March 2000, Hammond introduced the landscape photographer Joel Sternfield to the railroad. His images (some appear in this book) of an ecosystem that was growing on the abandoned line created significant interest in the structure. The design of the resurrected High Line—completed in 2004 by James Corner Field Operations with Diller Scofidio + Renfro and the Dutch horticulturist Piet Oudolf—pays homage to the surreal world of industrial decay and natural regeneration captured in Sternfield’s photographs. Of course we all have our quibbles about the design and politics and even safety. What’s with those ugly tapered pavers? Why is the path of the second part raised above the tracks? Why is Oudolf’s prairie-grass-heavy palette supposed to signify “wildness” when it all looks so meticulously maintained? Will it look a little wilder as time goes by? Are vast amounts of money needed for that maintenance? For those of us with no professional knowledge, the information on plants along the walkway could be enjoyably amplified. And for Nervous Nellies, more info about the engineering of the railroad structure, the drainage system, and the placement of soil at the outer edges of the park would be welcome. For educational purposes, we’d like to know more about the political maneuvering involved in bringing the High Line about. Why have James Corner, ASLA, and landscape urbanism gotten so much praise because of this one built project? Still, these are basically only quibbles, for every designer has his or her opinions, and some of us are always nervous. Corner will have more built work soon, some other advertising gimmick will replace landscape urbanism, and a book of longer informational articles on the High Line is probably already in the works. Really, for the most part, what’s not to love about the High Line? Is the High Line an urban park for the use of the neighborhood or a tourist attraction that will be an inconvenience for local residents unless—economic disaster!—it loses its appeal? Can the High Line be the inspiration and model for similar parks in hundreds of cash-starved, development-eager cities around the world? LaFarge’s guidebook to the High Line provides, willy-nilly, some answers to these two important questions—and raises what is for me a much more puzzling third. As for question one, whatever the original intention, a sophisticated, informative, photograph-rich guidebook—complete with fold-out map—is in itself proof that the High Line is one of New York City’s most popular tourist attractions even for natives (who can possibly know all this architectural and cultural history? ), and its popularity is likely to last for some time. 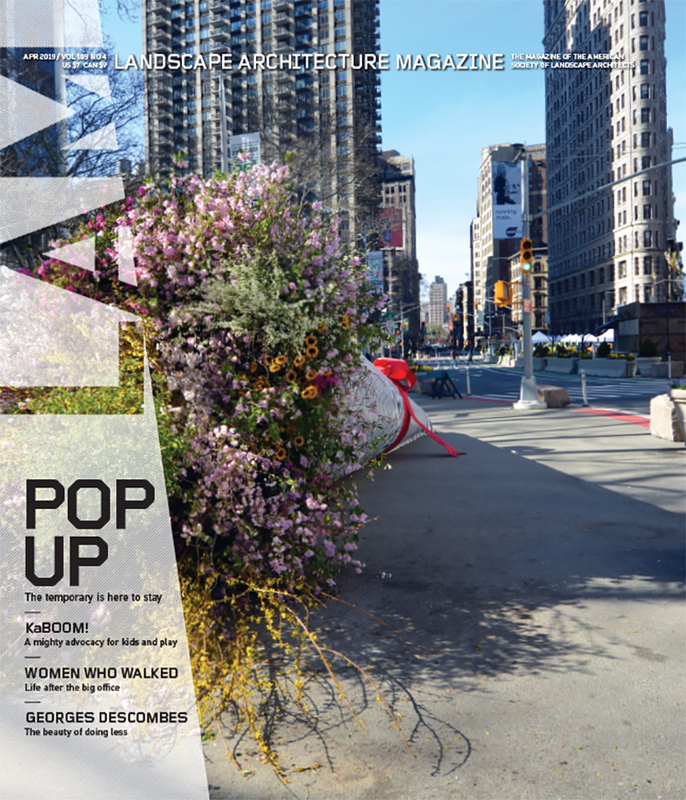 Whether the High Line can also serve as a neighborhood park will emerge as the park ages. If we wonder, as a corollary question, whether the effort and funds necessary to create the High Line might have been more profitably spent on improved transportation and more small urban parks, the one does not rule out the others. And no matter its size and location, an urban park today will engage and survive only by means of M and M (money and maintenance). Perhaps even more important is LaFarge’s unsolicited answer to question two. Can High Lines be created in other cities? LaFarge’s work suggests not. After all, New York City does have some decided advantages. First of all, the book’s photography testifies to the visual interest of the area, an interest that goes beyond the undoubted values of a different point of view provided by height and, sometimes, by a diagonal approach to the New York grid as well as by accidental closeness to and distance from contiguous buildings. (What is it like to have four million people a year peer into your bedroom window?) After all, the very richness of the New York City architectural heritage is something few cities can equal. From the High Line you can see buildings by Frank Gehry, Renzo Piano, Shigeru Ban, and Jean Nouvel; you can wonder at the exuberance of the General Theological Seminary building and the playfulness of the porthole windows of the Maritime Hotel; you can learn to appreciate the metal canopies and the Belgian block paving of the Meatpacking District; and you can see what LaFarge calls “the great spires,” the towers of the New York Times, the Condé Nast, the Bank of America, the Chrysler, and the Empire State buildings. And then there’s the history of what you see. Certainly the appeal of the historic ruin has been proven in other contexts: To the landscape aficionado, the regenerated railroad harkens back to such popular industrial-remnant schemes as Richard Haag’s 1975 Gas Works Park in Seattle, Peter Latz’s 1994 Landschaftspark Duisburg-Nord in Germany, and—the direct inspiration for the High Line—the Promenade Plantée, built on a railroad right-of-way that from 1859 to 1969 carried trains to the eastern suburbs of Paris. The High Line does not pass through a ruin (from the Latin, ruo, to collapse); rather it is filled with standing, although modified, evidence of a means of production that has simply moved on, detritus undergoing repeated metamorphosis. And then there’s the history that can’t be seen, the history of the culture that makes New York City worth looking at for us English majors who never feel quite fulfilled by physical design. There’s the Chelsea Hotel, for example, where Jack Kerouac wrote On the Road. On the Road! Of course one effect of LaFarge’s historical notes is that, again, we want more, a book of essays on the history of buildings along the High Line and a history of the culture that created those buildings. This is not to say that none of the other cities planning their own High Lines lack a rich history; for example, the Bishopsgate Goods Yard in Shoreditch (East London) sounds like a promising location. But not every city is so blessed. And what you would see from 30 feet up would be just as boring as what you can now see at ground level. Design, in the view of us English majors, can’t transform what isn’t there, although of course designers will tell you that every neighborhood in the world should quickly go search out its unique quality and build from there. Two questions down—and now there’s question three, the most disturbing: Why must design—so much design—go into the creation of the urban park? Why must clients have what the subtitle of the book calls America’s Most Original Urban Park—for I am told by various park designers that what clients these days want is, if not Most, then at least More! One activity after another, more uniqueness or more unusual if not unique gimmicks, something, in short, to occupy the minds of the users for every single second they are in the park. Not just grass and trees, paths and ponds. More. And in a strange way On the High Line provides insight into this client mind-set. Jam-packed with photographs and blocks of saturated color (all the book’s white space is packed with information in relatively small type), its very appearance speaks of an audience that has been provided with an activity for every conscious moment. Like overprogrammed children, the users of the High Line and the readers of this book would seem not to appreciate the notion that less can be more. Indeed, could they appreciate a traditional park? A Green Waste of Time, a Vacancy denoting Pointlessness, an Emptiness offering Nothing to Do, a doomed Actuality suggesting by contrast the never-ceasing, ever-enjoyable activity of the Virtual World? Well, everybody loves the High Line because there’s so much there, what’s not to love? Jane Gillette works at Peter Walker and Partners, Berkeley, California; is a freelance writer of fiction and criticism; teaches at UC Berkeley; and worked as an editor for Land Forum, Landscape Architecture Magazine, and Historic Preservation.